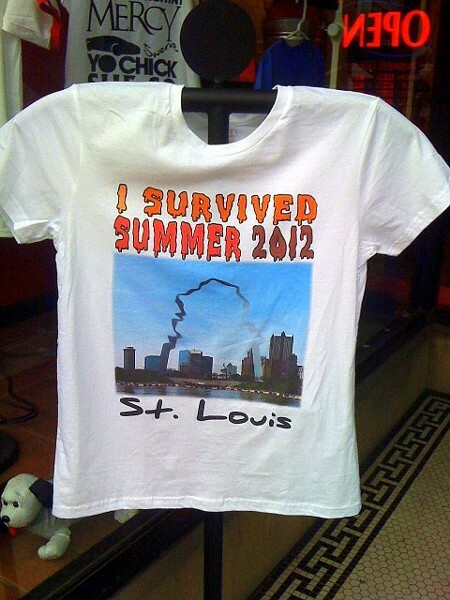 Isn't This Summer 2012 Commemorative T-Shirt a Little Premature? Isn't this a little premature? Especially since we've got 100-degree temperatures lined up as far as the National Weather Service can see? "I suppose maybe a little," says Nick Fusco, a Baked T's employee. "But the heat wave is almost over, I think." Are other people joining in his store's foolish optimism? "They just came out yesterday," Fusco says. "But at least one employee has bought one." Daily RFT is considering purchasing one as well, to hang on our cubicle wall as a reminder that we will survive this, and then spend the rest of our lives telling stories about it to young people who will undoubtedly be as bored as we are when other people start talking about various weather-related nightmares they lived through. Unless the Arch really does melt. Maybe then those young folks would listen.